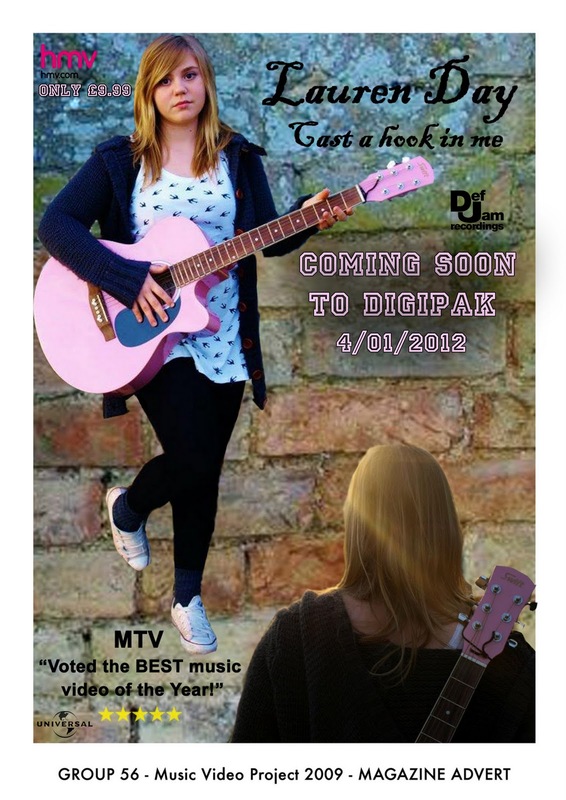 In the digi-pak, they have clearly shown the members of their boy band in a colourful, natural location, which means the conventions have been challenged, since most R&B-pop digi-paks would show the performers wearing very little clothing and possibly wearing golden chains or partially exposing their boxers, which isn't the case for this particular digi-pak, but since they are trying to promote a boy band, and the song is partially a pop song, having a natural location and wearing hoodies and jeans would be an effective way of promoting an R&B-genre digi-pak. Smaller pictures of the artist on the back cover, a greyscale image and the black and white font that has been used are another way in which they conformed to the conventions of standard digi-paks and therefore made the digi-pak seem like a digi-pak of a high standard. This group brought up specific details about how they portrayed their performers as members of a boy band, and how they managed to show this in all 3 parts of their promotional package. They also mentioned the use of close-ups, which they used to enable the audience to understand the emotions that are being portrayed by the performers. They also stated that their music video challenges two of the conventions of standard R&B-pop music videos, as they didn't include a narrative and the footage shows the performers messing about and being less serious than regular R&B-pop performers. This group has also given good examples of shots and pictures of the 3 parts of their promotional package, which provides strong links between the points that they are making about the 3 parts of their promotional package, and the actual examples themselves, which means that they have backed up the statements they are making with evidence, which makes the commentary look professional. In conclusion, I think that this group presented thier commentary very well, and feel that it is a commnentary of a very high standard. This magazine advert is very sticking when you first look at it, the bright colours attract you to the advert straight away. The Advert has all the main conventions that are requried, for exmaple the name of the artist, release date, pictures of the artist and reviews. Having the writng in different colours help the readers to be drawn in to see what each one of them says. The picture of the artist is very natural and having the guiter in the advert tells the audience the genre of the music without even having to listen to the song/album. From analysing Q1-11s Commentary, it was interesting to see how they used the idea of short-duration shots from other music videos they'd seen, and used this concept in their own music video to appeal to their target audience. They also tried to express the emotion of the artist successfully using dark lighting, and used a close-up of the artist as a way of portraying how miserable the artist is at a time when he feels particularly vulnerable. They have also clearly stated how they learned about what was necessary to improve their 3 products, using PhotoShop effectively to alter the colours of the 3 parts of their promotional package to express the strong emotions of the artist in the best way possible. In conclusion, I would say that this group stated their ideas and presented them well. However, I think the commentary could have been better if they had mentioned particular shots in their music video, their magazine advert and digi-pak and showed more of them in the commentary to give more examples of the changes they made, and how they helped to make the 3 parts of the package more appealing to their target audience. 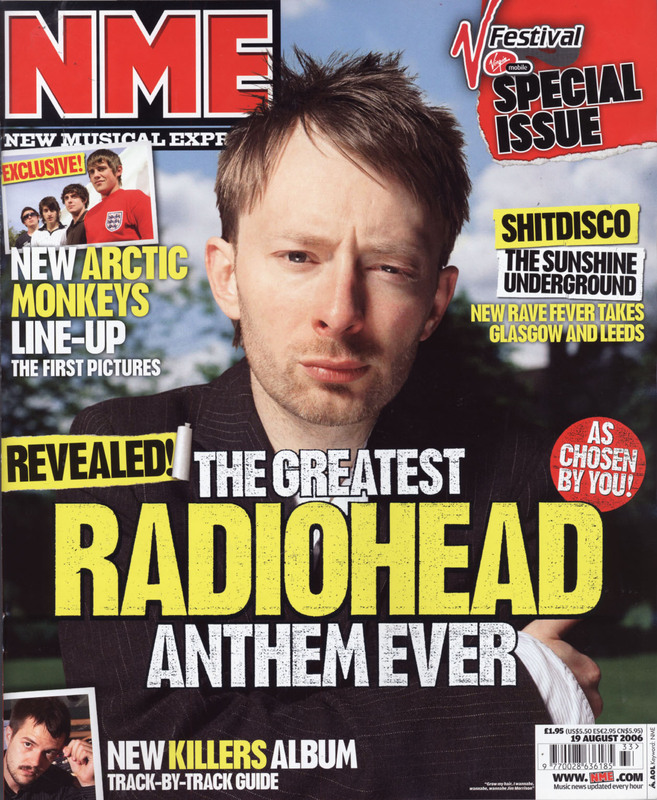 This magazine advert shows the artist from a band called "Radiohead" - who specialise in rock music. Rock genre magazine adverts usually have dark colours, and in this magazine ad this is no exception, as there is some dark green and black in the background. The mood of the artist portrayed in a rock magazine advert can also be very serious, which is the kind of mood which is being expressed by this artist in this magazine advert. There is also the company logo, the name of the company who produced the magazine, the bar code and the price of the magazine displayed on this magazine advert. The artist is stood in the centre of the image so that the artist is the main focus of the magazind advert, and the bold, capital letters (mostly in white and yellow) make the writing stand out as well so that the viewers would take notice of it, since they would assume that writing that is in big capital letters is about something surprising related to a particular music artist, which therefore makes the magazine seem interesting to read, meaning that the audience would want to read more about this by purchasing the magazine. 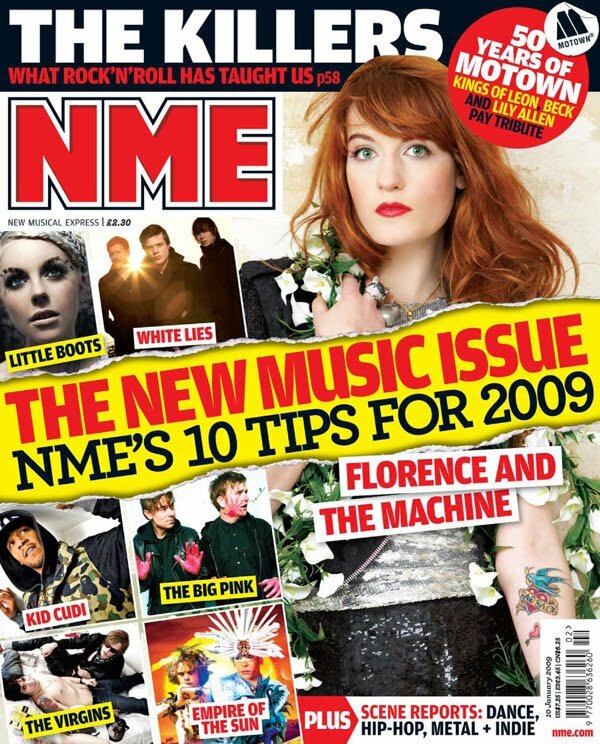 Florence and the Machine are an indie-pop band. Although this is the case, this particular magazine advert challenges the standard conventions of indie-pop genre magazine adverts because there is no natural location shown in the background, and there is no review or rating of the artist's album on the front cover, which is unusual. However, this magazine advert also conforms to the indie-pop genre in some aspects as well, as there are long vines with flowers on them which the artist is wearing (as flowers would normally be seen in indie-pop music videos and digi-paks) and a bold font in capital letters in bright red, white and black, which are flashy colours that are normally seen in magzine adverts of this particular genre. As with standard magazine adverts, the bar code and the price of the magazine, as well as a big image showing the music artist, can be seen clearly in this magazine advert, as well as a web address, the company logo (Motown), and the name of the magazine (New Musical Express).